A version of this post originally appeared at eGrollman. Over thirty years ago, Black feminist scholars and activists began emphasizing the importance of recognizing every identity and status of which each individual is comprised. 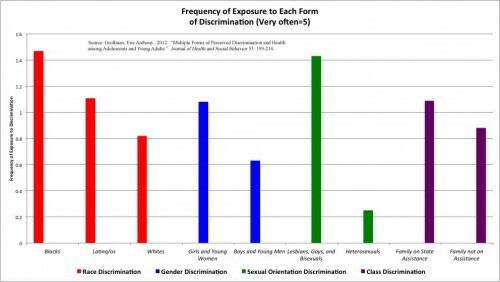 The crux of the perspective known as intersectionality is that we must account for the intersecting nature of our identities and statuses, as well as the intersecting and mutually-reinforcing relationships among systems of oppression, especially racism, sexism, classism, and heteronormativity. For example, a full understanding of the lives of Black women cannot come from considering their lives as Black people only, as women only, nor as the sum of these two sets of experiences. There is solid evidence demonstrating that one’s experiences with discrimination are consequential for one’s mental and physical health; however, these studies generally have not examined whether the relationship between discrimination and health depends upon the number of forms of discrimination individuals experience. 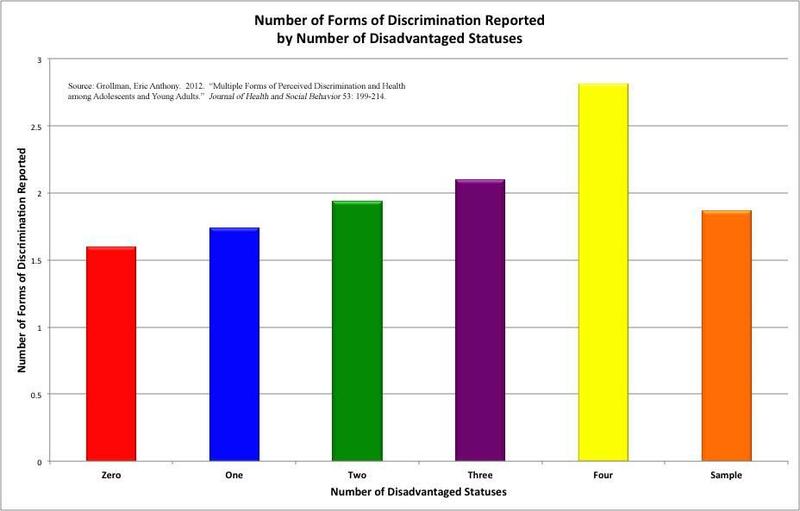 Could it be the case that individuals who face sexist and racist discrimination fare worse in terms of health than those who experience sexist discrimination or racist discrimination only? 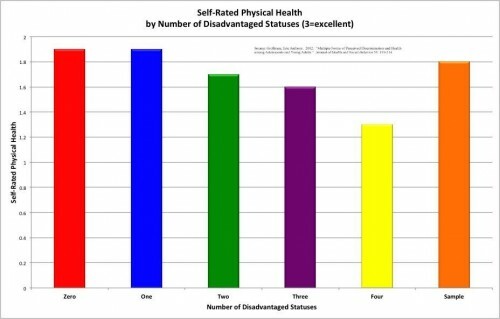 In an article I published in the June 2012 issue of the Journal of Health and Social Behavior, I find that the answer is yes, at least among youth. 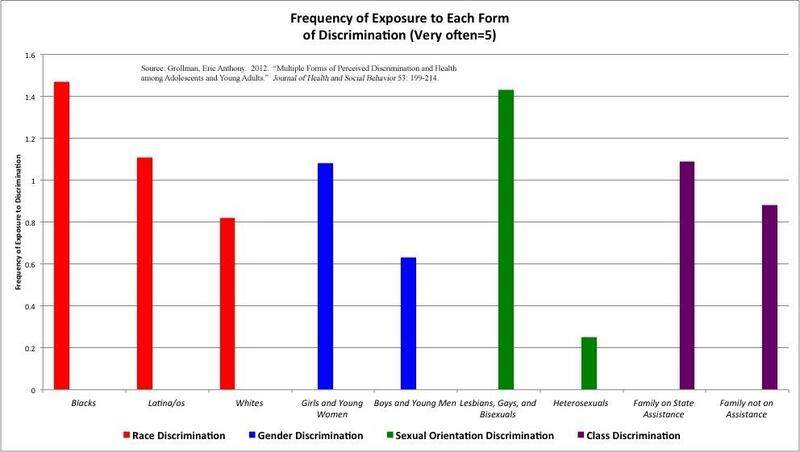 Using a sample of 1,052 Black, Latina/o, and White youth aged 15-25 from the Black Youth Culture Survey of the Black Youth Project, I looked at patterns in discrimination based on race, gender, sexual orientation, and class. These findings reiterate the importance of examining the intersections among systems of oppression. 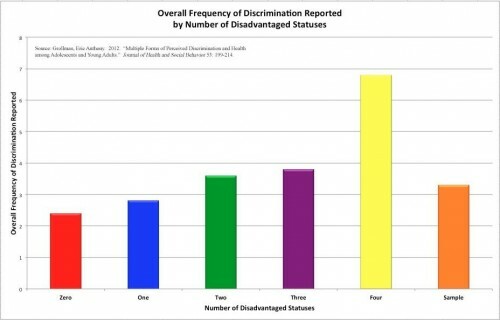 Only examining racial or gender discrimination, for example, would miss the fact that youth who are disadvantaged in more than one way face the greatest amount of discrimination. Unfortunately, scholarship and popular discussions of forms of disadvantage in isolation from one another continue to gloss over the experiences of individuals whose lives are constrained by multiple systems of oppression. Eric Anthony Grollman is a PhD candidate in sociology at Indiana University. His research focuses on the consequences of prejudice and discrimination on the health, well-being, and worldviews of marginalized groups. He blogs for the Kinsey Institute at Kinsey Confidential, and maintains a personal blog. I love this blog so much that is serves as my homepage when I access the internet. However, the past few days I have been having issues with images; they are no loading and appear as gray boxes or have the "broken image" icon in the center. Is anyone else having a similar difficult? I can't really tell from the figures, but do the effects of each additional disadvantaged status multiply or add to the well being measures? 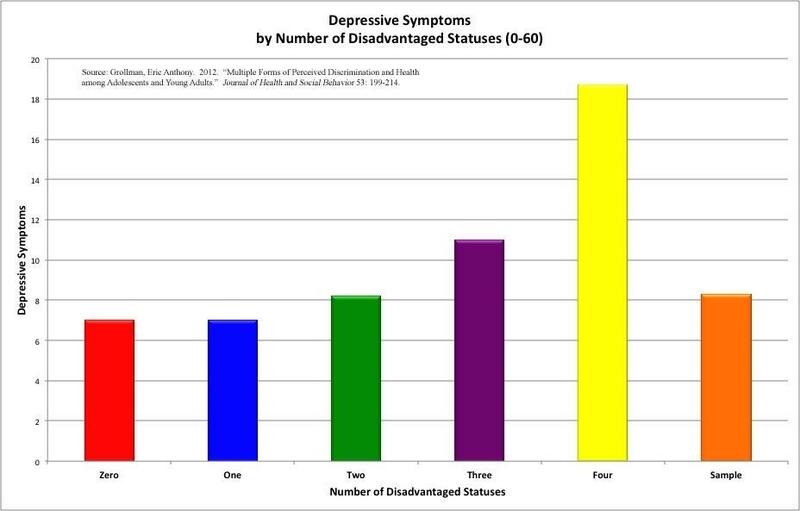 So is, for example, the difference between 4 and 3 disadvantaged statuses larger than the difference between 3 and 2? Just FYI, especially when writing in Spanish, the preferred gender neutral way to write Latina/o is "Latin@"